Hygrophilous and cold-resistant, delicious and nutritious... it's All about the beans. They have a lot of protein, and the protein composition close to the squirrel meat. Moreover, the protein in beans twice! And the value of beans - in high content of vitamins, important amino acids and mineral salts. Should plant is undemanding and useful plant in my garden! In may, when the ground is still wet, you can dry sow bean seeds directly into the garden bed. Beans grow well on any soil except sandy, boggy and acidic. Before sowing the bean bed should be dug to a depth of a shovel and make 2-3 kg of humus or compost. After the soil should be leveled and watered with a solution of a growth stimulant. The beans should be at a distance of 10-15 cm from each other. Seeds should be buried to a depth of 6-8 cm is Often sown with beans, potatoes or cucumbers – such a neighborhood increases the yield of all these plants. To prevent the emergence of weeds and soil crust formation before germination the soil must be loosened with a rake. Beans germinate in 5-6 days after planting the seed. In the event of a cold snap they can easily withstand temperatures up to -4 degrees. From the start to the end of the flowering beans especially demanding to moisture. Sprouts appear within 10-14 days after sowing. While the beans are growing, the soil between the rows is recommended to handle hoes, but should be discontinued when the plants reached a height of 50-60 cm). Beans is fertilize with nitrogen fertilizers. 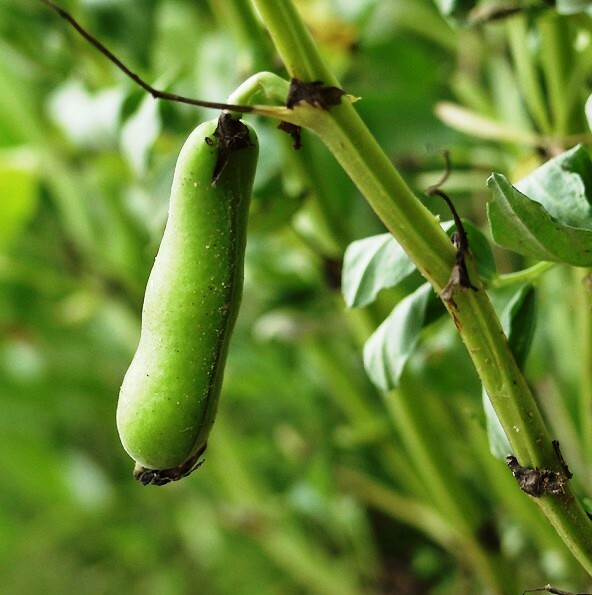 When the pods are formed, the tops of the stems will need to pinch back. This will increase the flow of nutrients in the fruit and protect plants from black aphids. In addition, against aphids the plants are regularly treated with a two - or four percent emulsion of green soap. Beans will protect the entire garden from the invasion of moles, so you should sow them on the boundaries of the site. In addition, the beans gather nitrogen, and therefore in the beds they can be valuable precursors for vegetable crops and potatoes. Most suitable for growing varieties of beans – "black Russian", "Belarusian", "white Windsor", "Windsor green" and "Lankaran-large", "Svaneti" and "Altai".